by Ram A. Cnaan, Stephanie C. Boddie, and others. University of Pennsylvania Press, 2006. As a scholar and professor, Ram Cnaan had long recognized the scarcity of social science research on congregations: who they are, how they are defined, and what role they play in their contexts. In response, Cnaan conducted his own ecumenical and interfaith research with more than 1,300 Philadelphia-based congregations. 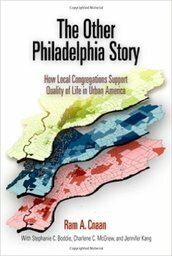 Cnaan’s goal was to identify and measure the social service needs that congregations in Philadelphia fulfill. Cnaan conducted interviews with more than 1,300 congregations and concluded that congregations play a vital role in the well-being of their communities. Along the way, Cnaan explores Latino and Black congregations and the role of women; reveals how congregations use their space, and discusses different programs and help that congregations offer. The book also includes notes, an extensive bibliography, and a detailed index. Cnaan’s work is appropriate for clergy, judicatory and lay-leaders from all religious traditions.